Pikachu and his friends Snivy, Tepig and Oshawott have arrived at the Wish Park, but discover they are unable to leave. The legendary Reshiram and Zekrom tell Pikachu that he and his friends can save the park and return home. 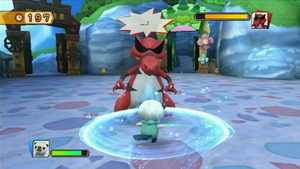 As well as the single-player campaign, there are multiplayer chase and battle modes where up to four players can take part, each as a different Pokemon.